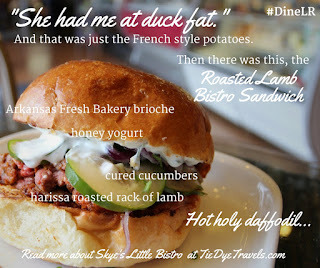 She Had Me At Duck Fat - A First Visit to Skye's Little Bistro. An opportunity to dig into a new eatery as part of a great promotion? I'll take it. But I certainly wasn't expecting the ridiculously gorgeous flavors I encountered at Skye's Little Bistro on Third Street in Little Rock. So worth the visit. I'm no stranger to Dugan's Pub, which is right next door to the subject matter of this particular article. Don Dugan's been serving good food to me since Markham Street Grill and Pub. I've even been in Stratton's Market before - though at the time it was a far smaller affair. However, my travels a good portion of this year have sent me far from my Little Rock home. I'd missed out on the opening of the little bistro within Stratton's. 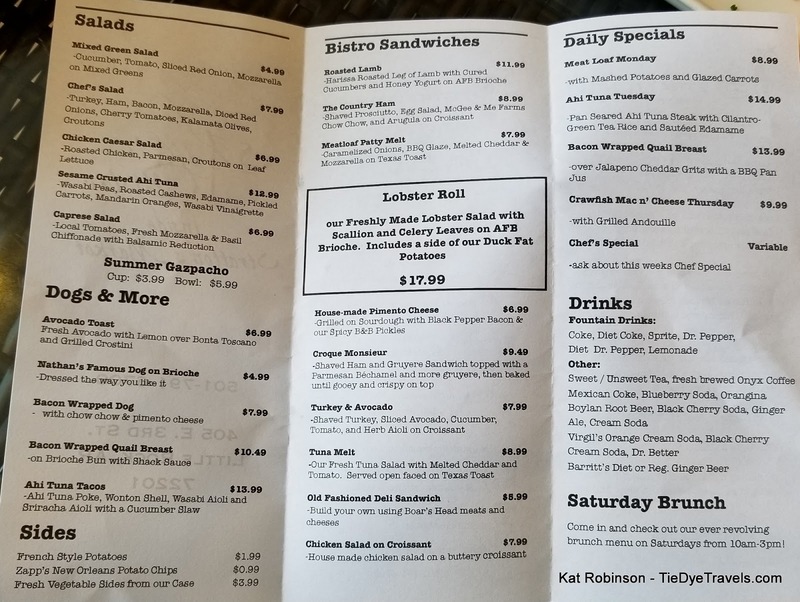 But Little Rock Restaurant Month's promotions, which included a whopping 50% offer to those who not only darken the door at Skye's Little Bistro but also check in on Facebook, ensured I'd give this place a try. I mean, I'm on a budget. Aren't we all? Did I look at the menu before I arrive? No. Did I research the living daylights out of the place? No. In fact, I just told my phone the place and it brought me to the door at Stratton's Market. Yes, you read me right - I honestly went to this place because I saw an ad. Bet you've done that a time or two as well. I came in the door and there was a deli counter right there. But to my left, there was... well, frankly, a lot more than the last time I'd been in the place. The local-friendly, locally packed room on the east side of the restaurant has almost everything a River Market dweller might need to enjoy life - from booze to laundry detergent, fresh produce and dairy and more booze. I'm sorry, I know, that seems like a lot of booze but that was my first and honest impression. A lovely young woman who looked really familiar to me was at the register, and she explained to me that I needed to order at the register first and then have a seat. I opted to pay first but she wasn't that concerned, knowing I'd pay before I left. Turns out, this was Skye. And Skye? Well, she comes across as a whole lot of awesome to me. The moment I saw roasted lamb on the menu, I was sold, and I placed my order. She asked if I'd like a side. Now, I've been watching my diet lately, and was thinking no side. Then she said duck fat. Well, c'mon folks. DUCK FAT. In particular, French style potatoes fried in duck fat. It'd have been a crime not to. I had a seat at one of the four two-person rounds on the market's west side - the entire complement of seating for the place. At my right was a photographer who was waiting for dishes to shoot. Turns out, Monday was the very first day of the new menu. He was there to shoot it for Skye's Little Bistro's Facebook page and social media. I understand that. I do that myself. Mind you, at this point in the visit, I knew who Skye was and she knew I knew her dad and I've written about food around here, but I really doubt anyone else had a clue. I'm not special. I'm just another hungry diner. And I was there to dine. To my left in the window was a gentleman who was tearing into the daily special of meatloaf. Tearing into. Relishing. Visibly enjoying himself. On his knee he had a copy of the Arkansas Times open to the page on Little Rock Restaurant Month. We started up a conversation. Turns out, he'd never been to Skye's, or Dugam's, or most any place around downtown to eat before. The Little Rock Restaurant Month promotion had drawn him out to see what was available, and with this very first meal he had already decided the two-page compendium of downtown eateries would be his itinerary to a culinary exploration of his hometown. I wouldn't know anything about that at all (/blatantlie). One of the gentleman who'd been cooking behind the counter - and dangit, I should have asked his name, I am remiss on this - came and brought us each a small plate. He declared we were his guinea pigs and we would get to try a little lagniappe in the form of ahi tuna tacos. He left us each with our little taco cup to experience. I would not have ordered this. I'll order it next time, because it comes with three identical quadruplets and is just $13 on the regular menu. Or, this week, $6.50 with the mention of that ad and a Facebook check-in. Hot holy daffodil. The photographer was working away at shooting a tuna melt to my right. The diner to my left elaborated on his new favorite find. I silently squee'd to myself. Like something out of a magazine. Glistening Arkansas Fresh Bakery bun. Curls of rotisserie carved, marinated lamb. Sharp and bright thinly sliced cucumber. A smash of what appeared to be taziki sauce but which was actually a lush honey yogurt immulsion. A single bite and I had just bitten into the richest dish I've encouncountered this week. wait. No. Get up from where you're sitting right now, check out from work or wherever you are, go walk a few blocks (or get in your car) and get over to Skye's Little Bistro and try this. Do it. Do it now. I'm checking for my car keys. My stomach just chided me for reminding it how good this was. I was there. Photos were being taken. How could I *not* shoot this and show you? Well, the real reason because is that night, once I had sat down and written what I needed to write for the evening, tucked my child into bed and kicked back with my list for the following day, I dug back into the other half of that sandwich. See, I was worried. I was concerned that my placement that day betwixt a food photographer who was also capturing the house avocado toast and the bacon wrapped hot dog with chou chou and pimento cheese and the enthusiastic foodie newly discovering his culinary locale might influence the words I need to put down about this place. Not only did that Arkansas Fresh Bakery brioche stand up to being refrigerated, but that lamb... that lamb was still knock-your-socks off good. So now I'm torn. That particular block of Third Street is already on my list of regular haunts, between the corbee toast at Dugan's and the Nutty Irishman at Andina's. I have so many other restaurants to explore during Little Rock Restaurant Month - and like everyone else reading these words, I'm on a budget. I want to cover as many restaurants as I can. 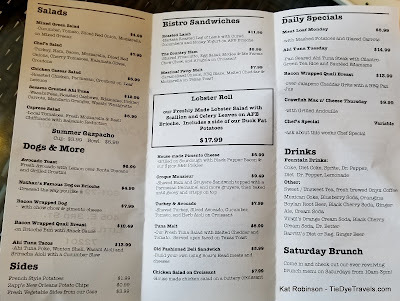 But the menu at Skye's may mean I skip a few places just to come back and dabble with more of the astonishingly good fare I found in this tiny neighborhood grocery. The Arkansas State Fair has nothing on the creativity of this bacon-wrapped dog with chou chou and pimento cheese. Nothing. You? Yes, you. The special runs through Saturday (Skye's is closed on Sunday) and it's too good to pass up. 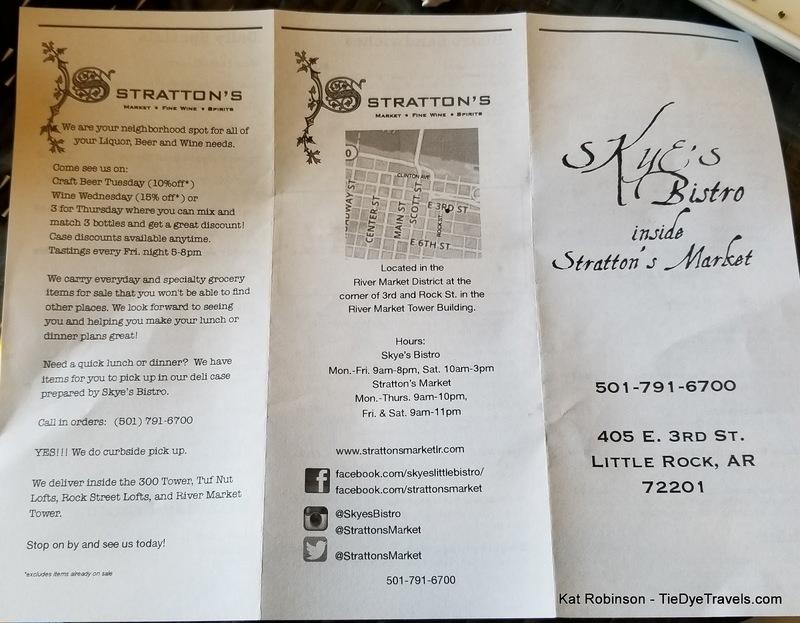 Head over to Skye's Little Bistro inside Stratton's Market at 405 East Third Street. Check in on Facebook and mention the promotion. And then come back here and tell me, in the comments, what you had. Because even with the promotion, I have just one belly, and there's just so much I can experience. Here's a link to that Facebook page so you can check in. And here's the menu. Click to make it bigger. Thank the gods your words do not have calories!! But they are delicious, all the same!